"J. I. BALCOM, who lived north of Hollis on the PULLIAM farm near McKnight, is moving to Erick, where he bought one of the best farms in that part of the country." 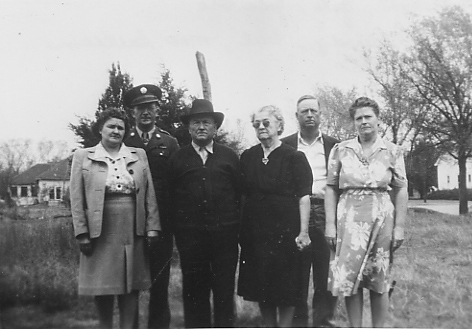 John Ira Balkcom and Ida Lucinda (Baldwin) Balkcom, of Dale County, Alabama, were the progenitors of the Balkcom family of western Oklahoma. Born in Alabama a few years after the Civil War, they moved by wagon to Texas in 1901, then on to Oklahoma Territory in 1906 where they settled first near the town of Hollis, and later in Erick in 1918. J. I. was a farmer, with income also from occasional mineral leases and some insurance sales. In addition to cash crops they produced much of their food on the farm, with cows, hogs, chickens, and vegetable garden. Their children Mae (1897-1989), my father Euel (1903-1981), Thelma (1905-1971), and Jake (1909-1961) all lived their lives in Erick or Sayre.